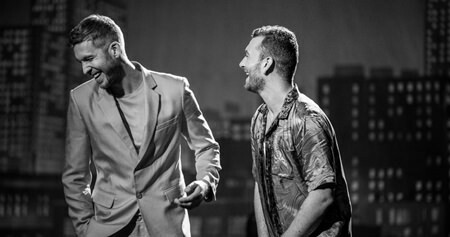 Calvin Harris and Sam Smith extend their reign at Number 1 to a third week on this week’s Official Singles Chart. The pair’s collaboration Promises easily claims another week at the summit, just shy of 6,000 combined sales ahead of their closest competition Benny Blanco’s Eastside ft. Halsey & Khalid (2). Promises was streamed 6.8 million times over the past week, and is Calvin’s tenth UK chart-topper and Sam’s seventh. Elsewhere in this week’s Top 5, Marshmello’s Happier ft. Bastille lifts one place to 5 to earn the elusive producer/DJ his third Top 5 single and Bastille their fourth. Two songs enter the Top 10 for the first time this week: club hit In My Mind by Dynoro & Gigi D’Agostino jumps six spots to Number 8, and Silk City (aka Mark Ronson and Diplo)’s Electricity ft. Dua Lipa hops five places to Number 10. The track is the first from the Silk City project to enter the Official Chart, while Dua claims her sixth Top 10 in the space of 18 months. Machine Gun Kelly’s scathing diss track to Eminem, Rap Devil, zooms 16 rungs to Number 15, David Guetta’s Don’t Leave Me Alone moves up five places to enter the Top 20 at 18, and Australian singer-songwriter Dean Lewis lifts five places to 22 with his global breakthrough hit Be Alright. Finally, two songs make their Top 40 debut this week: Jason Derulo notches up his nineteenth UK Top 40 single with Goodbye ft. David Guetta, Nick Minaj and Willy William, up ten spots to 33, and Sigala’s Just Got Paid ft. Ella Eyre, Meghan Trainor and French Montana vaults 14 to 37. This entry was posted on Friday, September 21st, 2018 at 7:35 pm and is filed under Music News. You can follow any responses to this entry through the RSS 2.0 feed. Both comments and pings are currently closed.